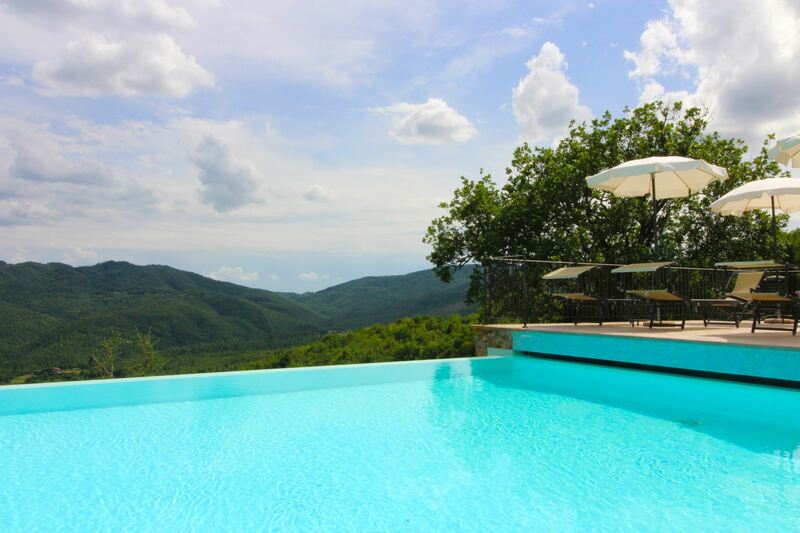 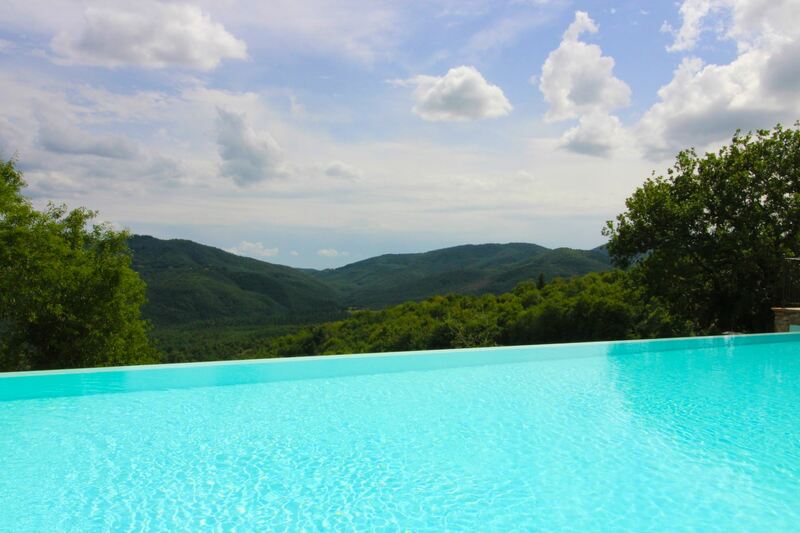 Borgo di Usciano, 20 sleeps, infinity pool, a few km from Arezzo, Tuscany. 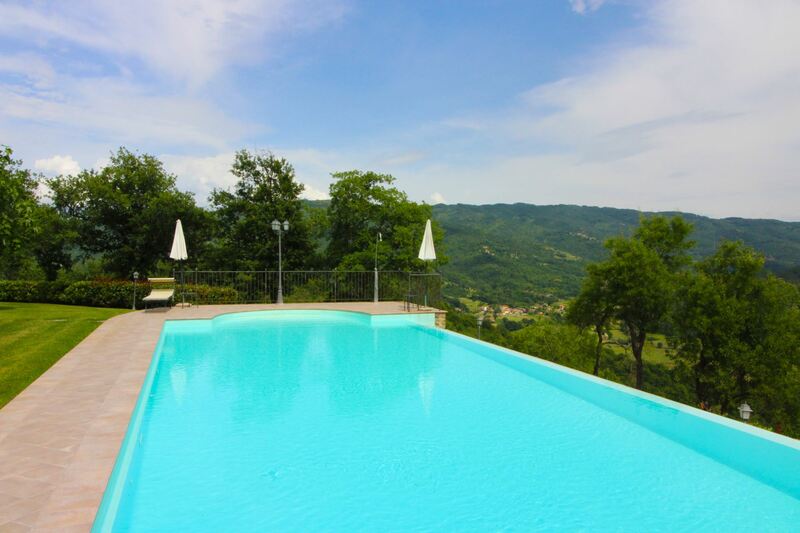 Ancient stone hamlet placed in a panoramic position just a few kilometers from the city of Arezzo, 20 sleeps, beautiful infinity pool. 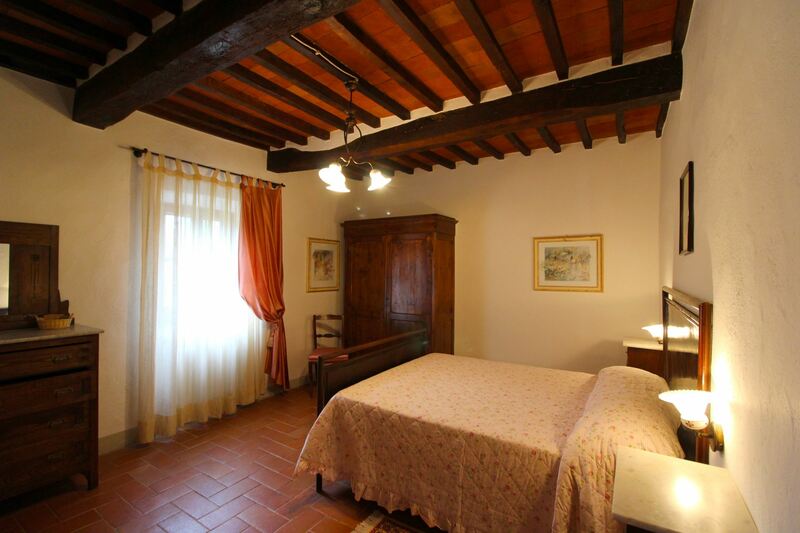 Palazzo del Pero is only 2.5 km away. 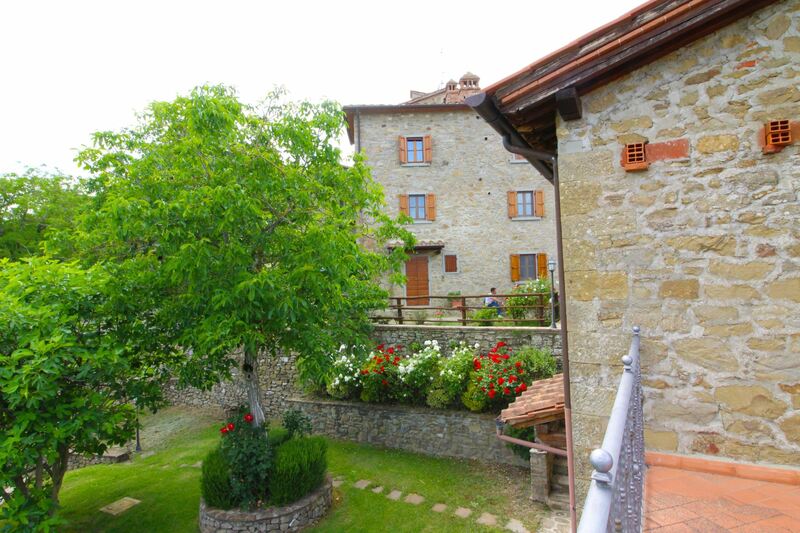 The old hamlet of Usciano. 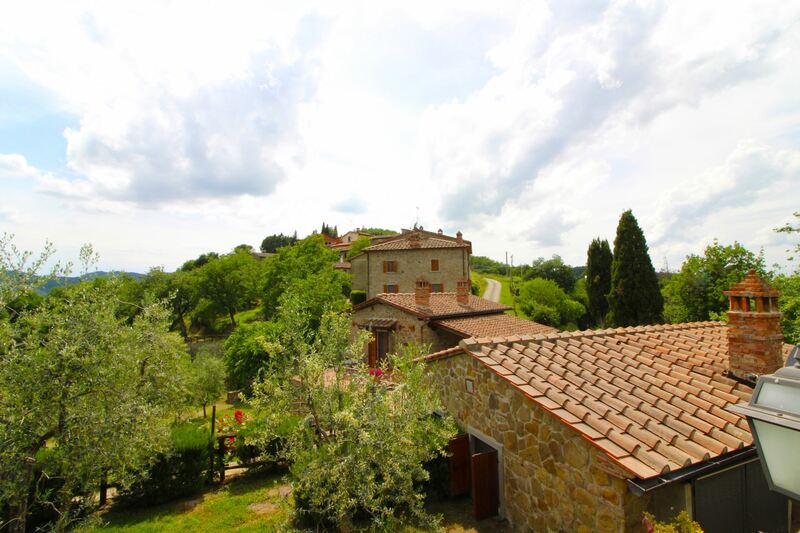 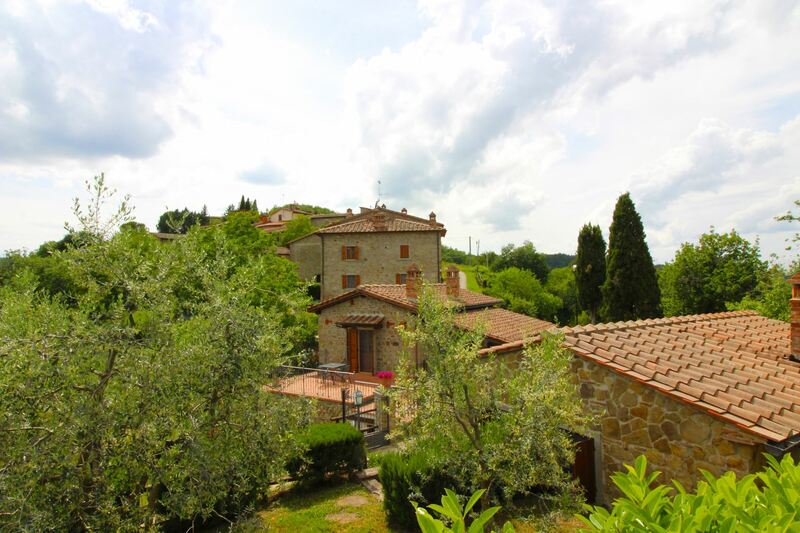 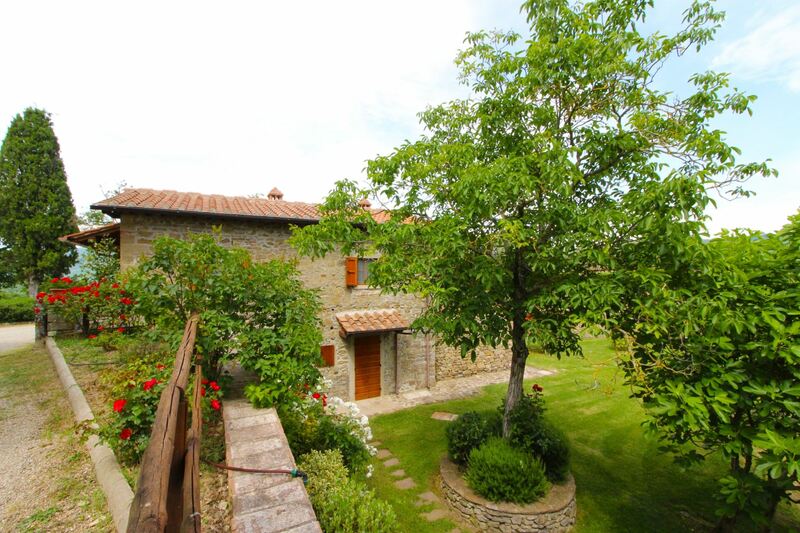 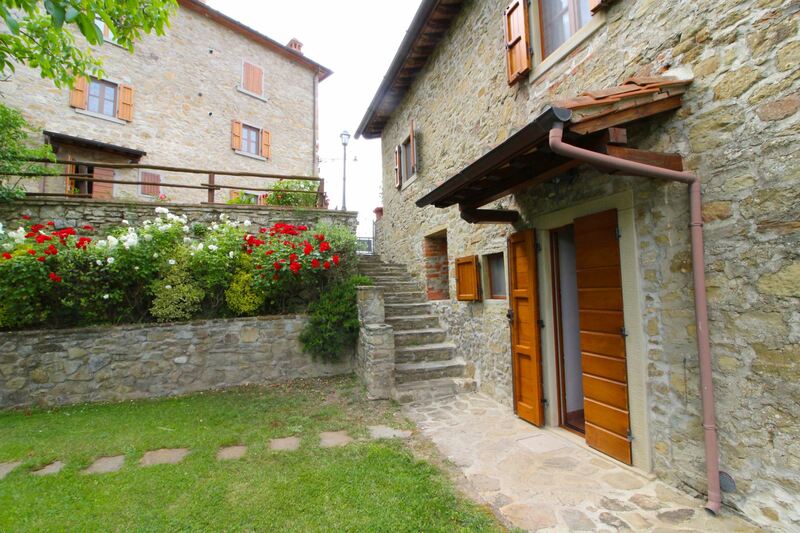 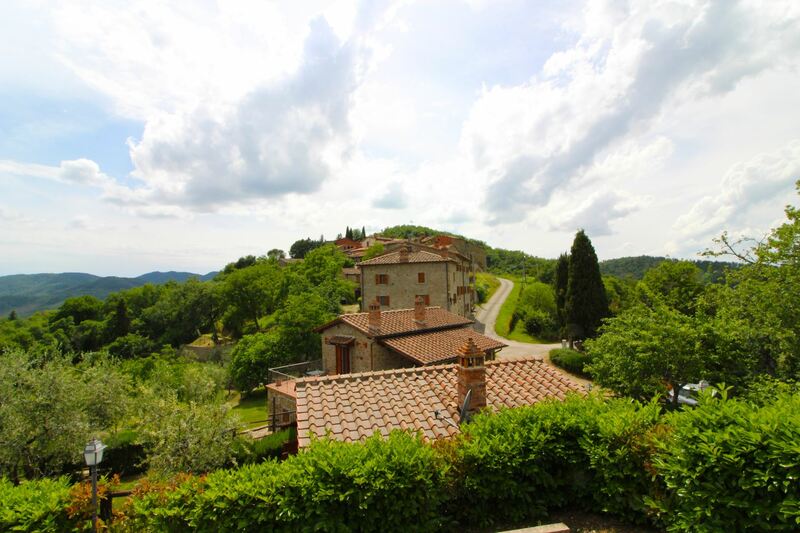 Usciano is an old medieval hamlet, located a few km from the city of Arezzo. 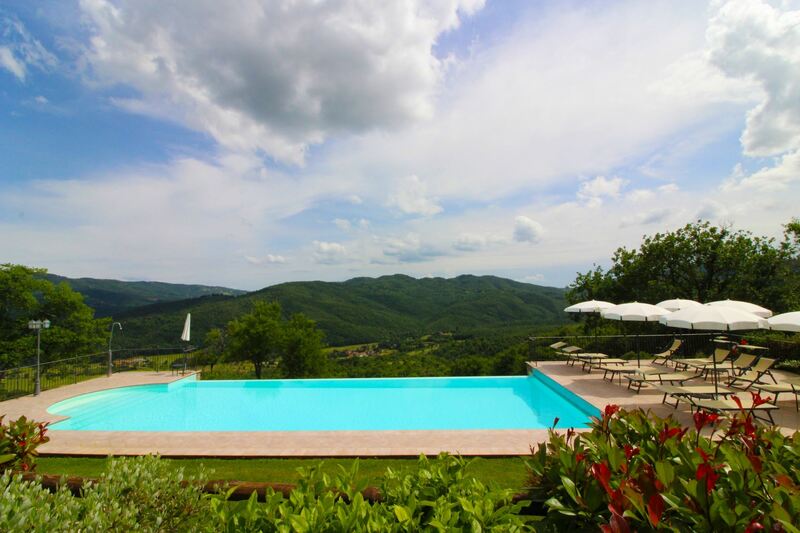 It is placed on a panoramic position, perched on a high hill, surrounded by olive groves and green forests of oaks and holm oaks. 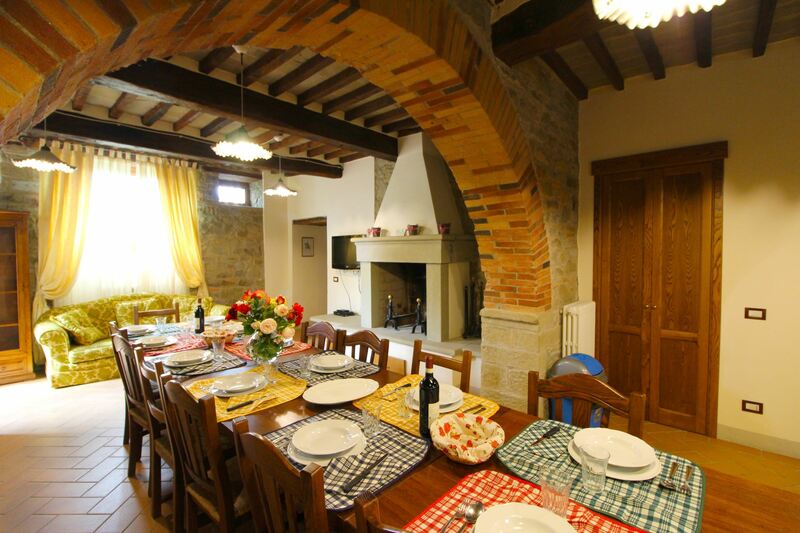 The stone farmhouse with its two small cottages date back to 1851, when the small village was inhabited by woodcutters, peasants and chestnut harvesters, and have been restored maintaining the original features and using ancient materials such as terracotta, stone and old wooden beams. 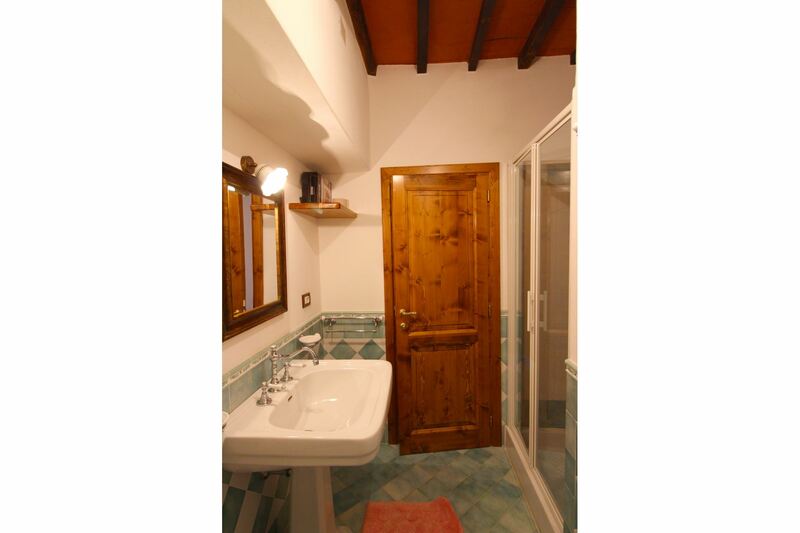 Furnishing as well, functional and comfortable, has been chosen respecting the rural traditions. 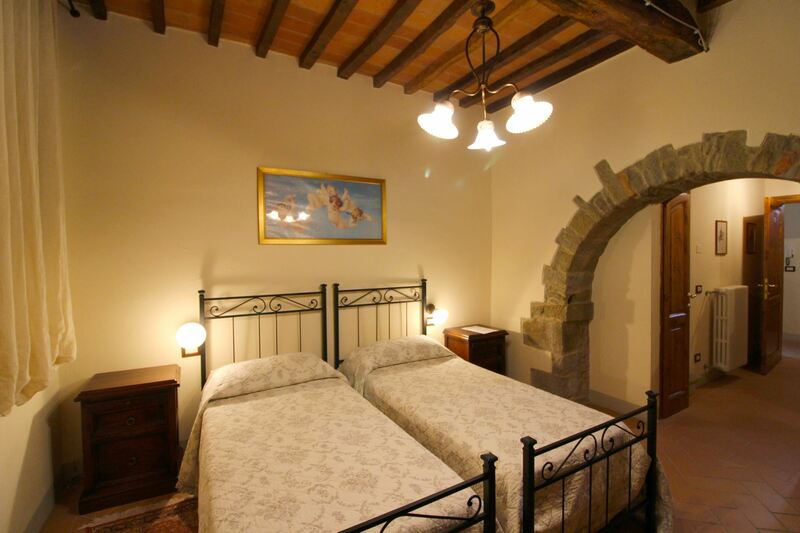 The city of Arezzo and its monuments. 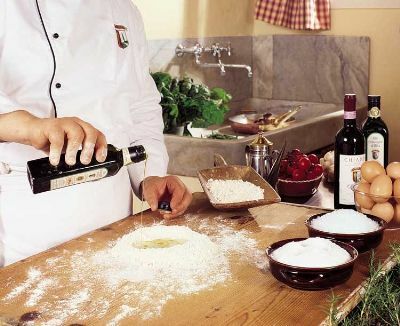 Only 2,5 km away there is the village of Palazzo del Pero where you can find restaurants, small grocery shops and a pharmacy. 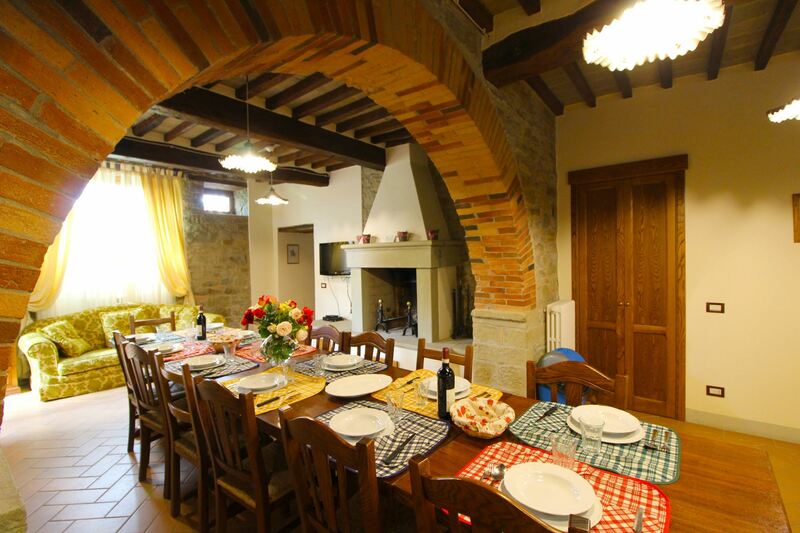 In the city of Arezzo, which is only 9 km far, besides shops, supermarkets, restaurant and services, you can spend wonderful days discovering the medieval old town, its squares and the noble palaces, the works of art by Piero della Francesca, Cimabue, Vasari, scattered throughout the city and fully enjoying the daily life of this small town of Tuscany. 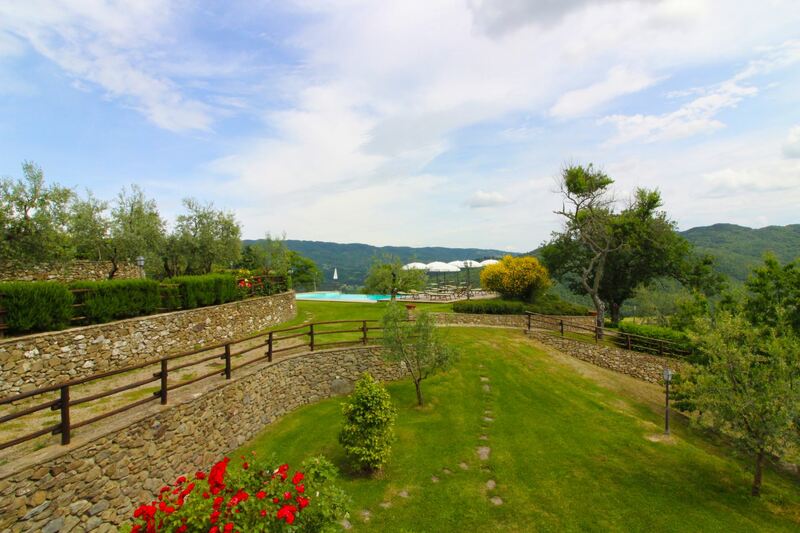 Garden and swimming pool on panoramic terracing. 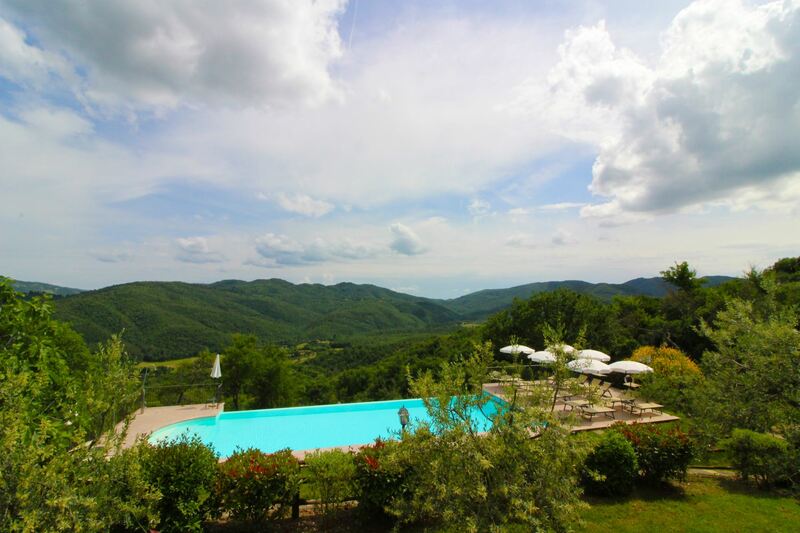 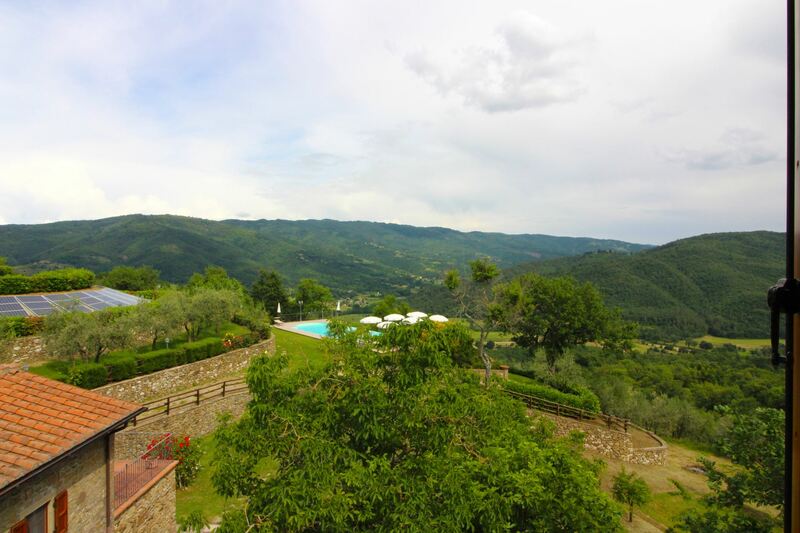 The outdoor space of Borgo di Usciano is located on panoramic terracing, where you can find the wide and green garden and a beautiful infinity pool (size m. 7x14, depth m. 1-1,60) with equipped solarium and overlooking the San Chimento valley. 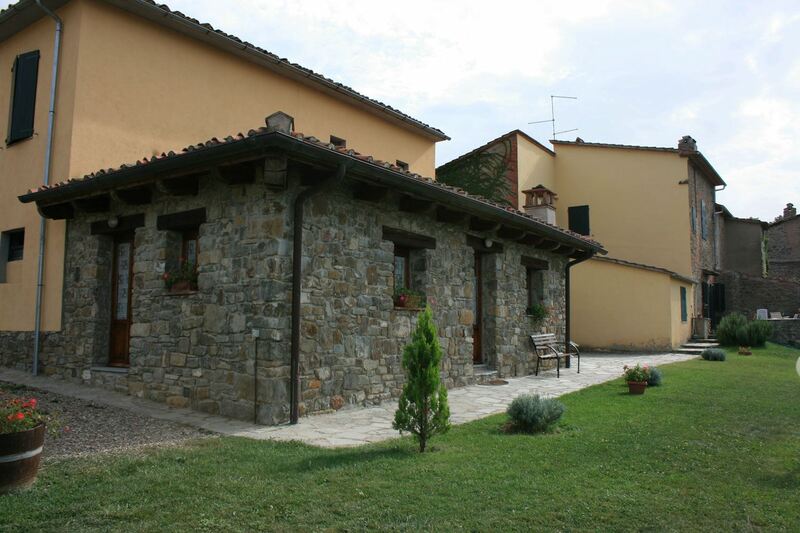 At clients full disposal a fenced parking, barbecue area with wood burning oven and a fully equipped laundry room. 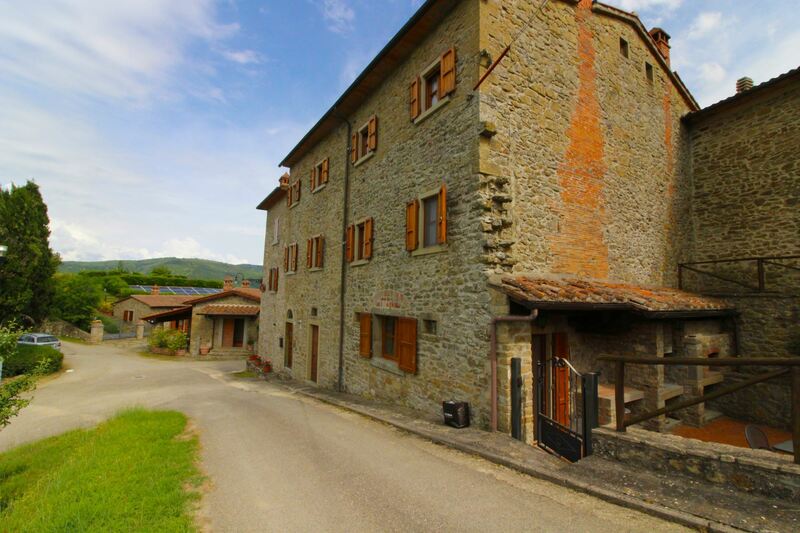 Borgo di Usciano is reachable through an unmade road in the wood approx. 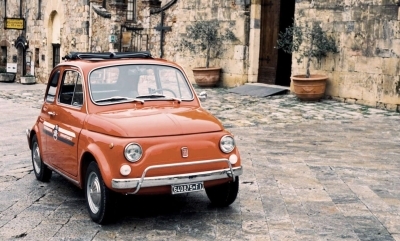 1,5 km long, well maintained and suitable for all cars. 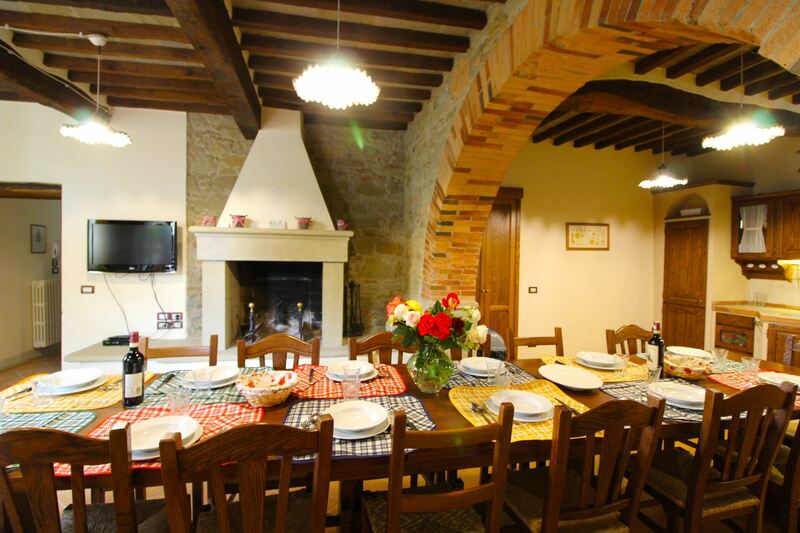 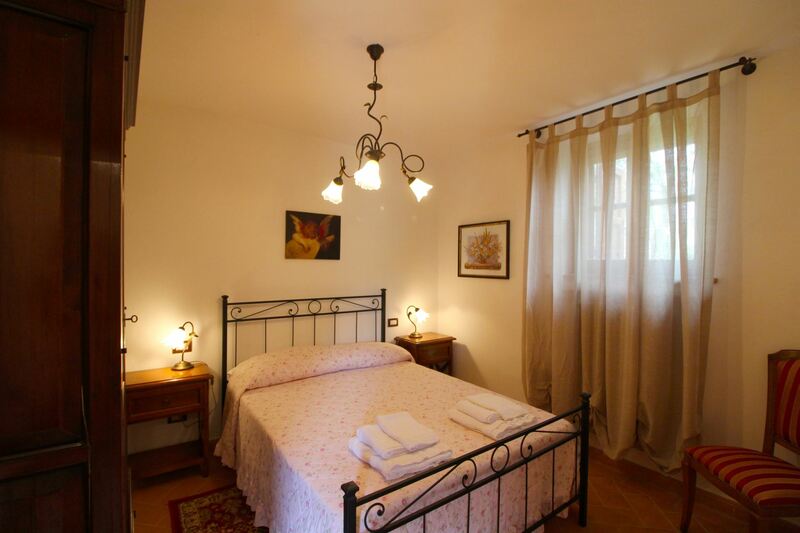 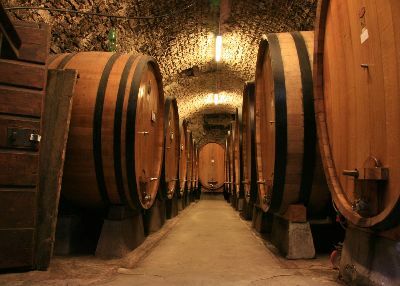 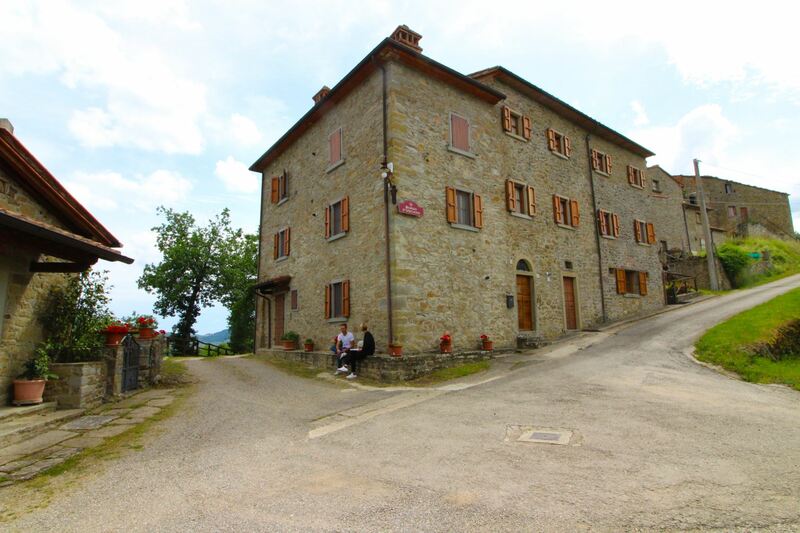 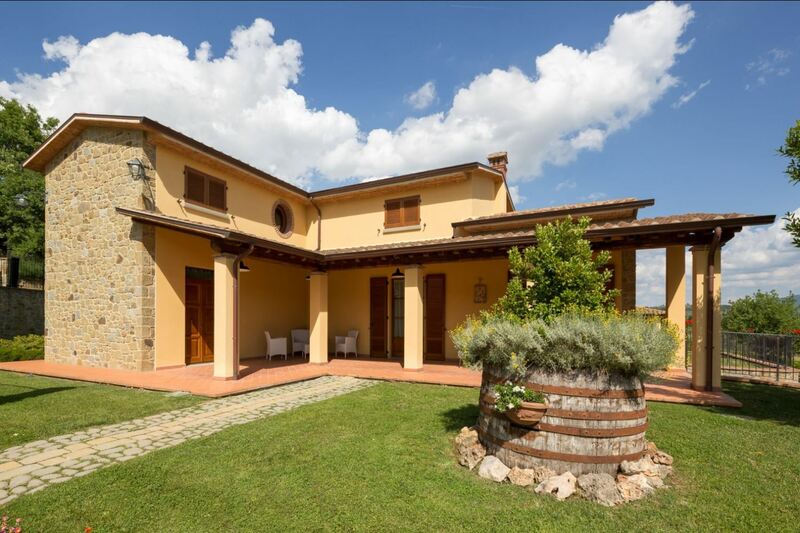 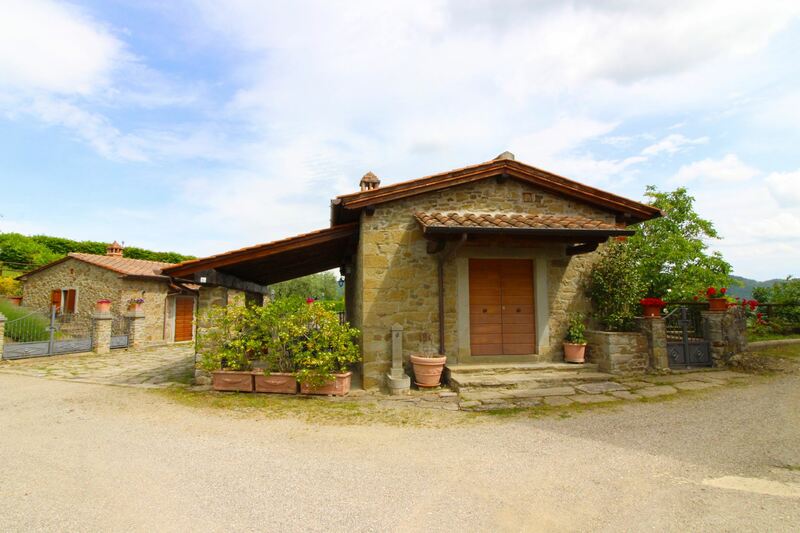 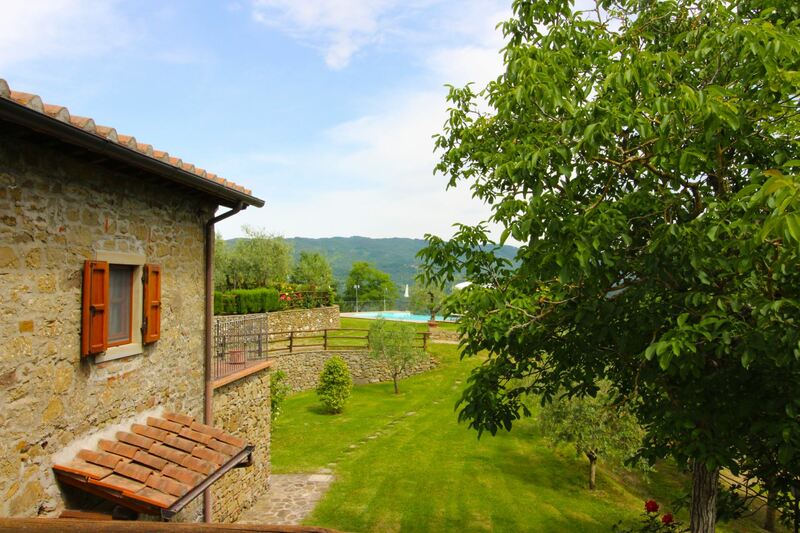 Upon request, the owner can organize tastings in the villa with typical Tuscan products, massages and tours of the area by mountain bike with guides. 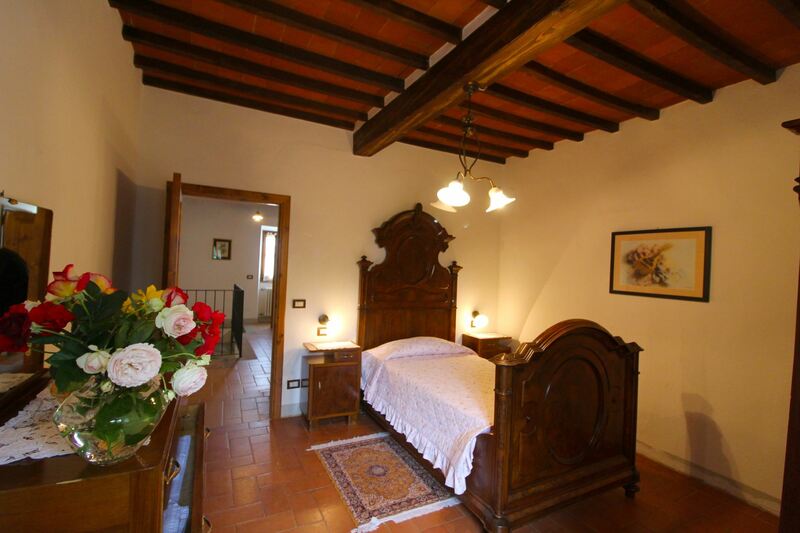 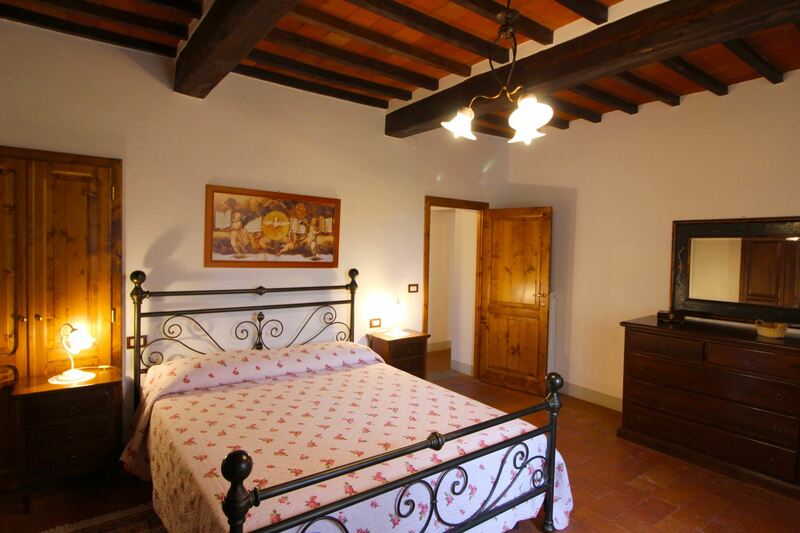 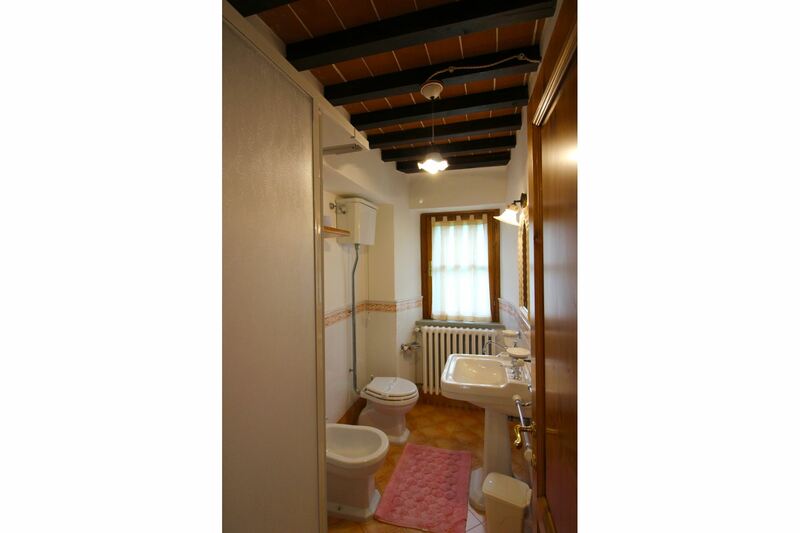 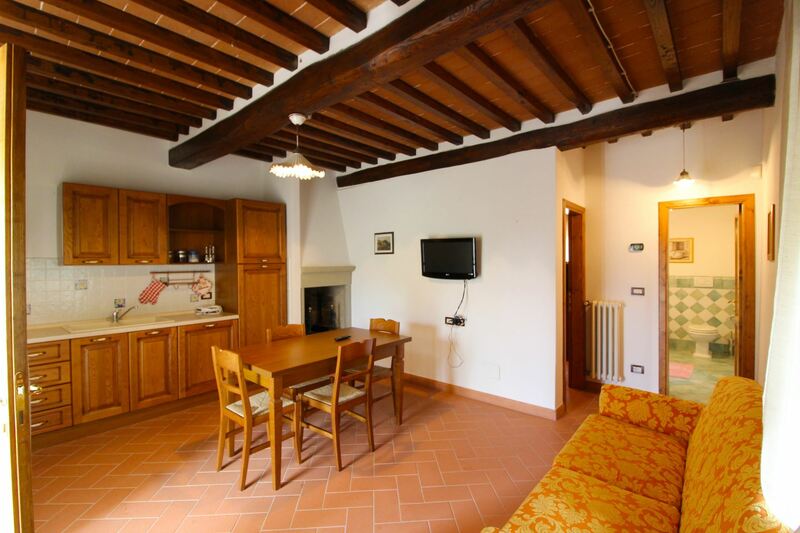 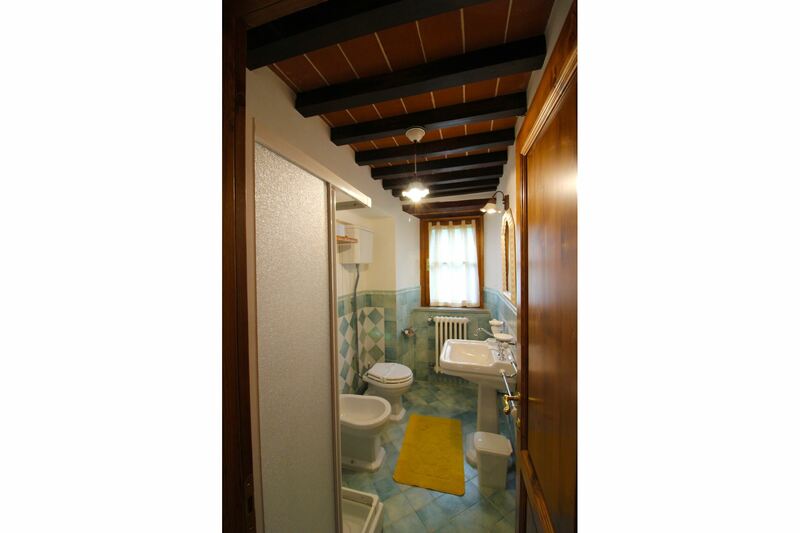 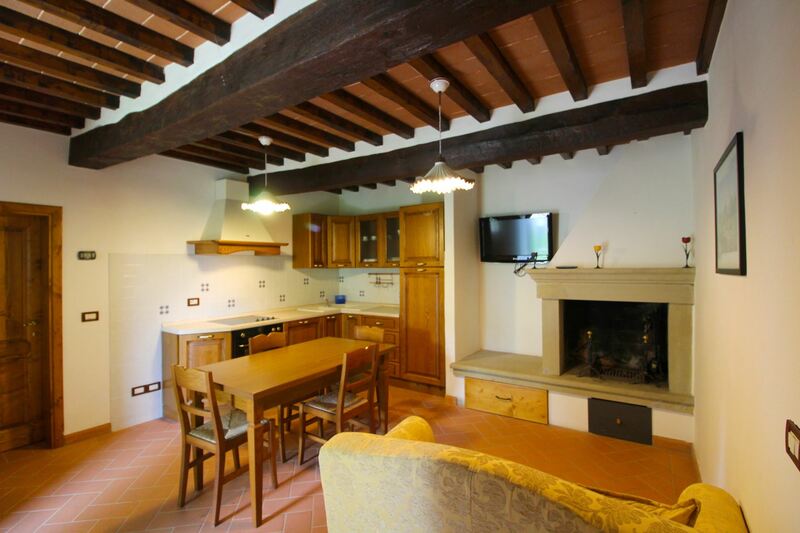 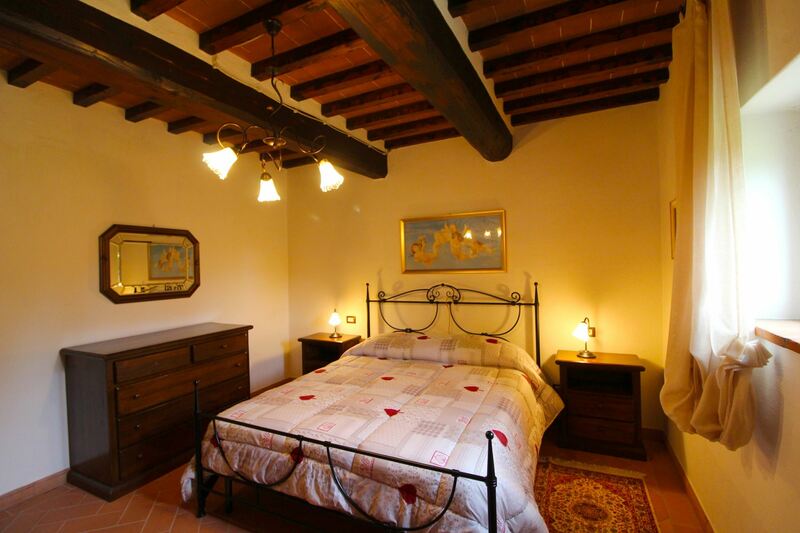 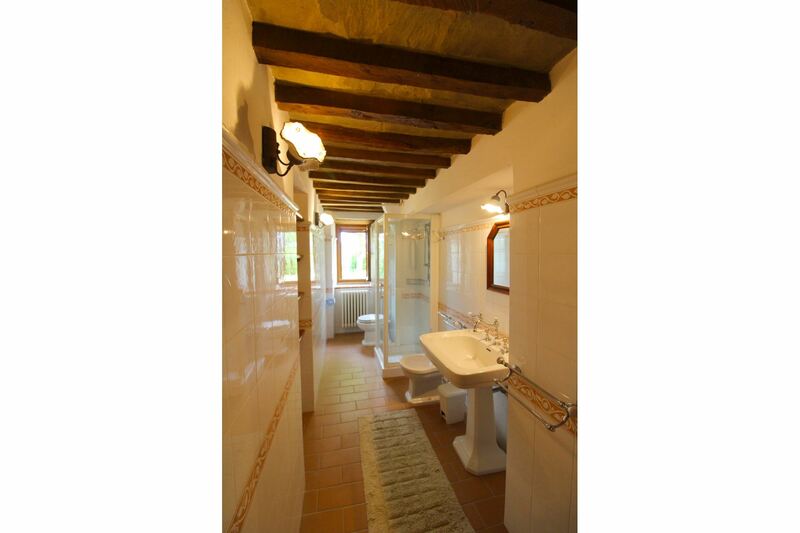 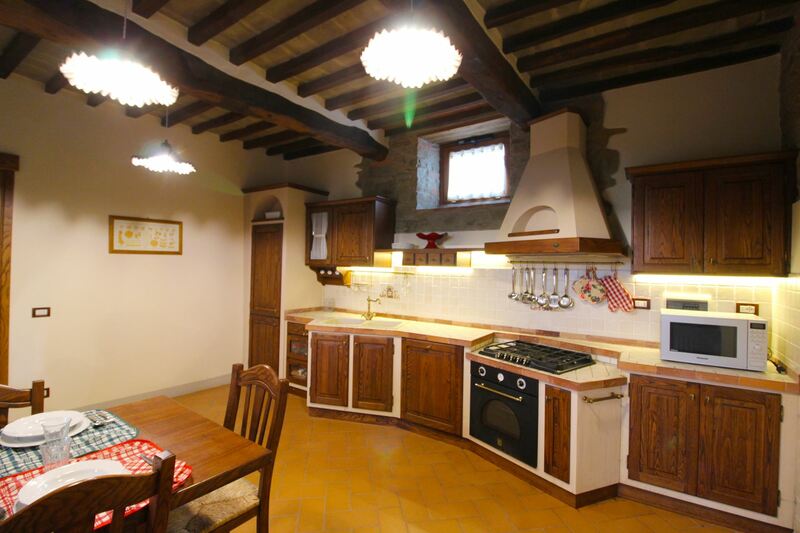 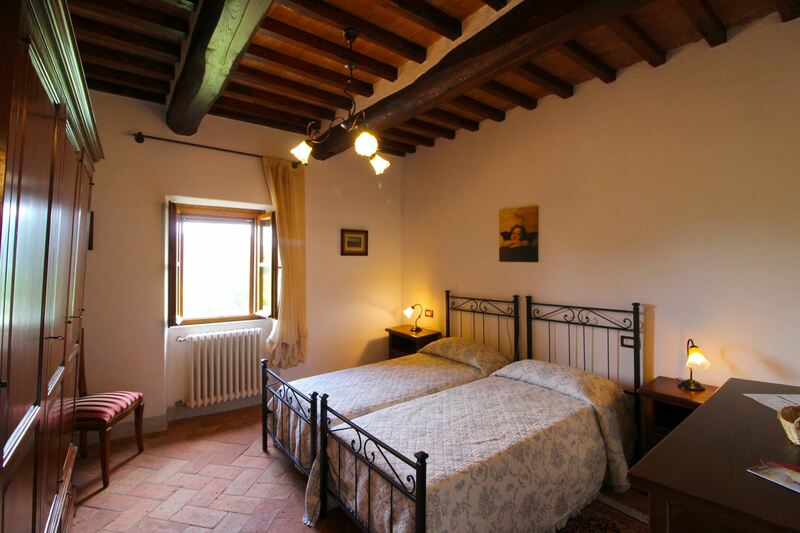 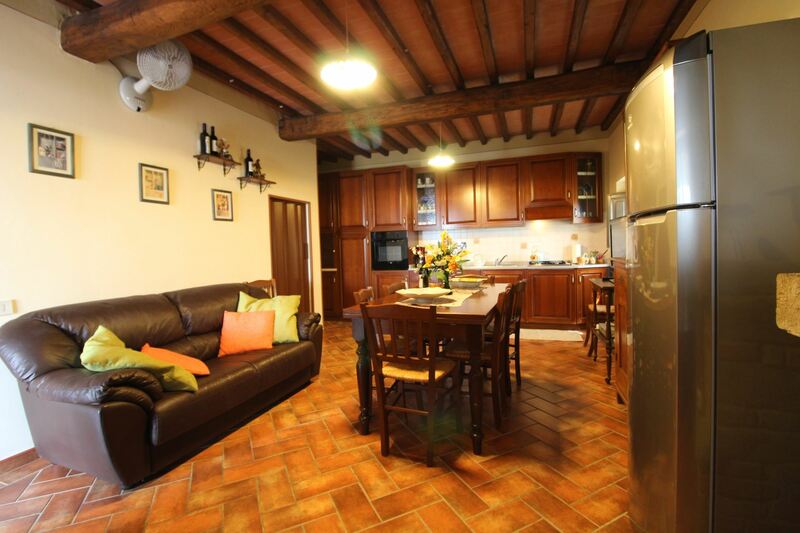 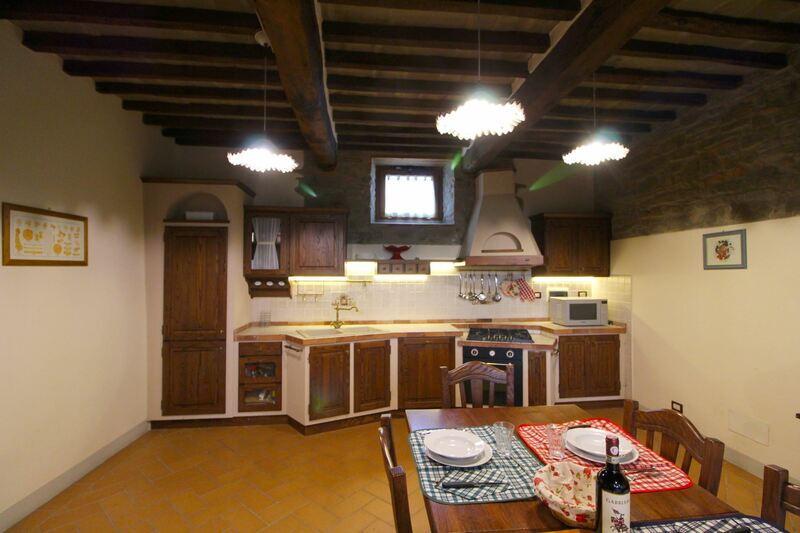 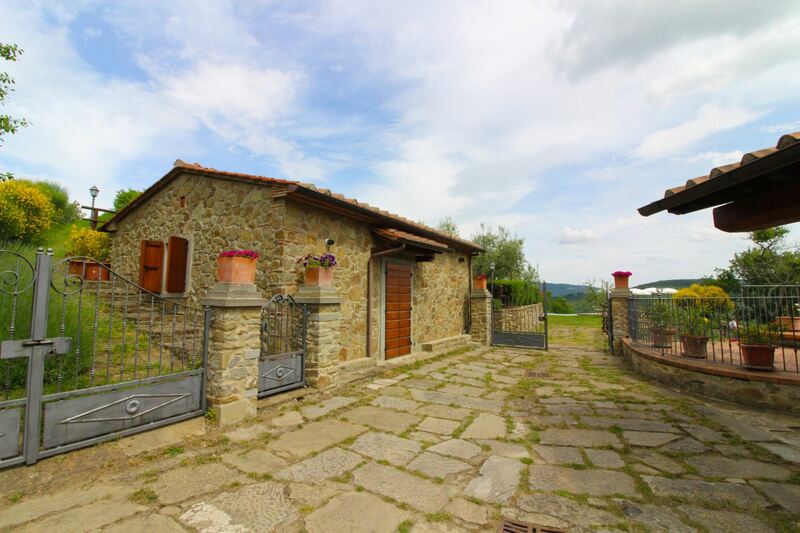 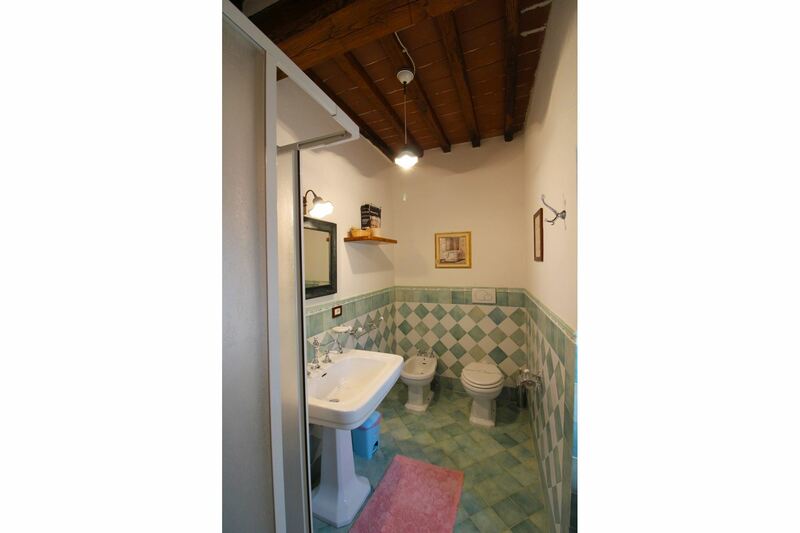 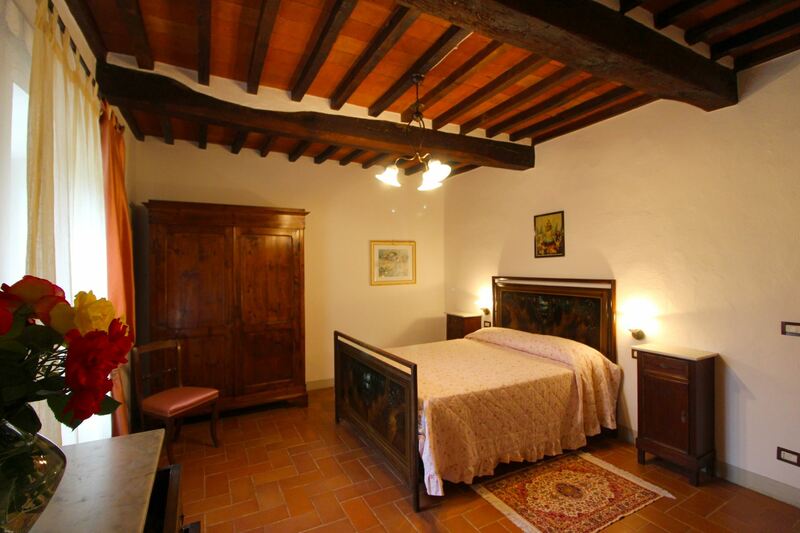 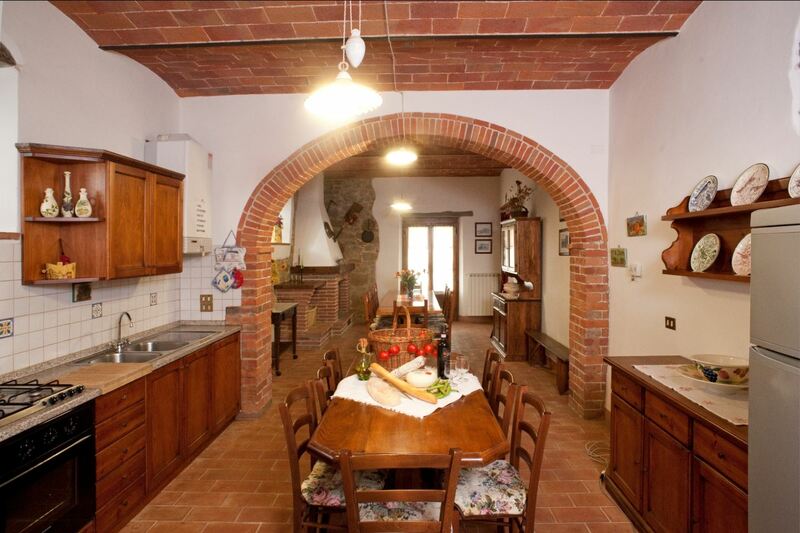 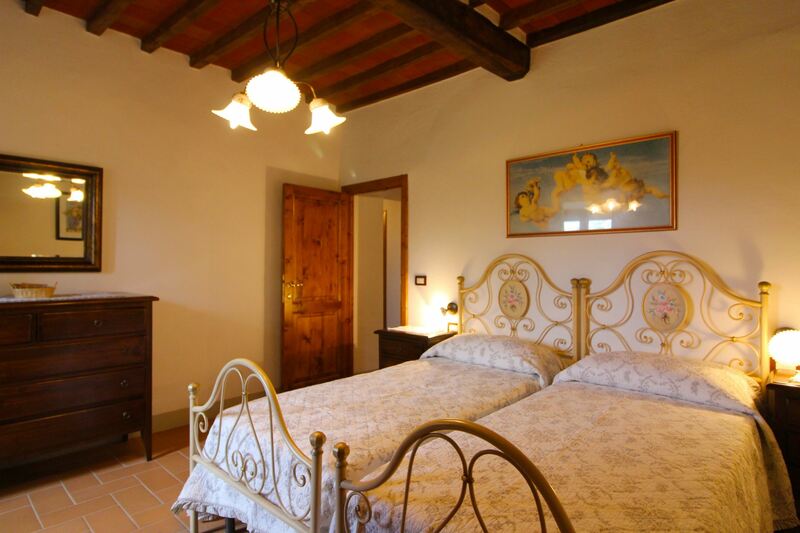 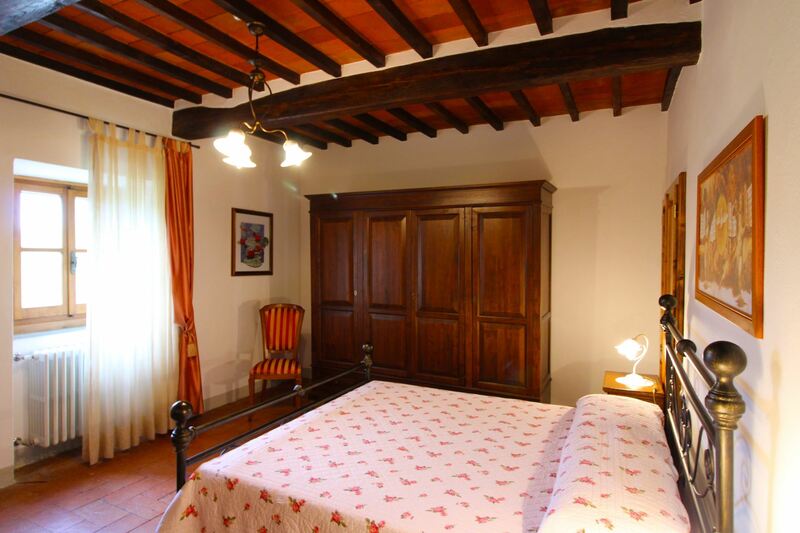 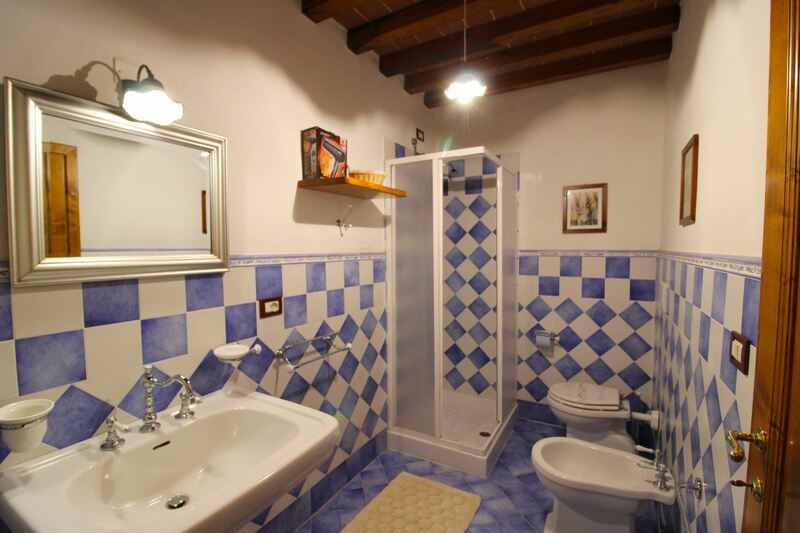 The property consists of a main farmhouse and two houses with separate entrance. 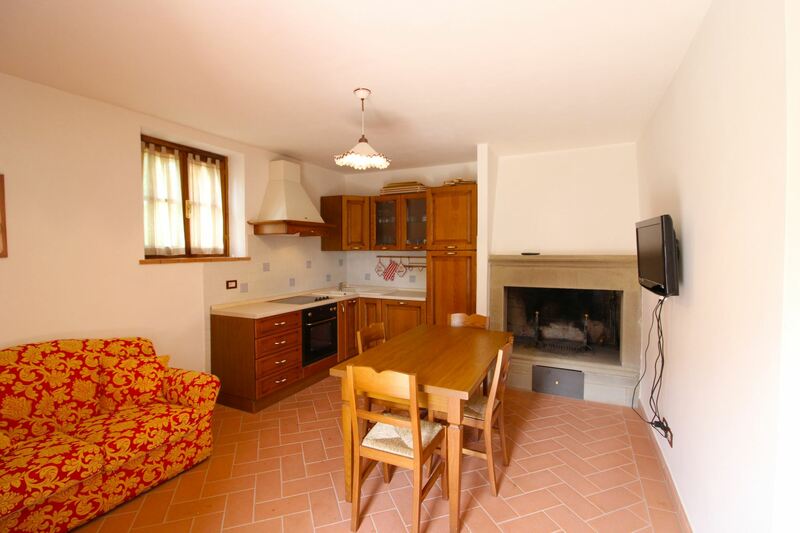 Ground floor: wide living-dining room with kitchen, fireplace, sofas and tv, twin bedroom and bathroom with shower. 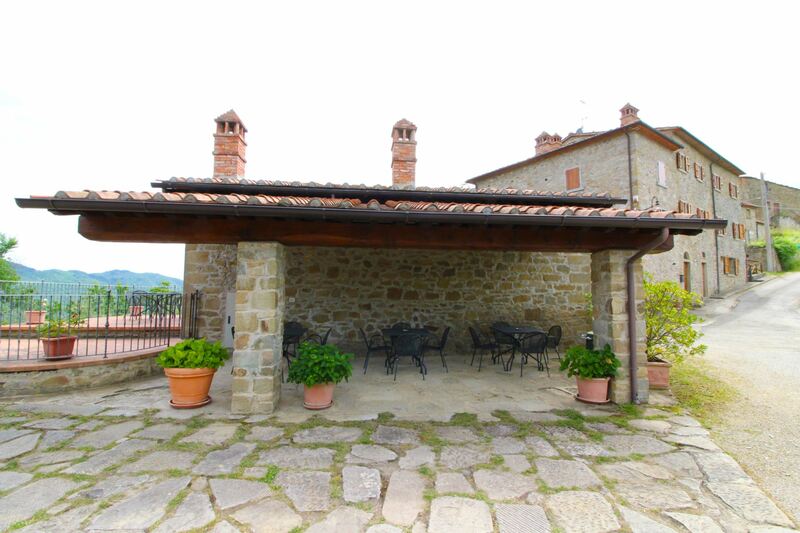 Access to a paved outdoor area with tables, chairs, barbecue and wood burning oven. 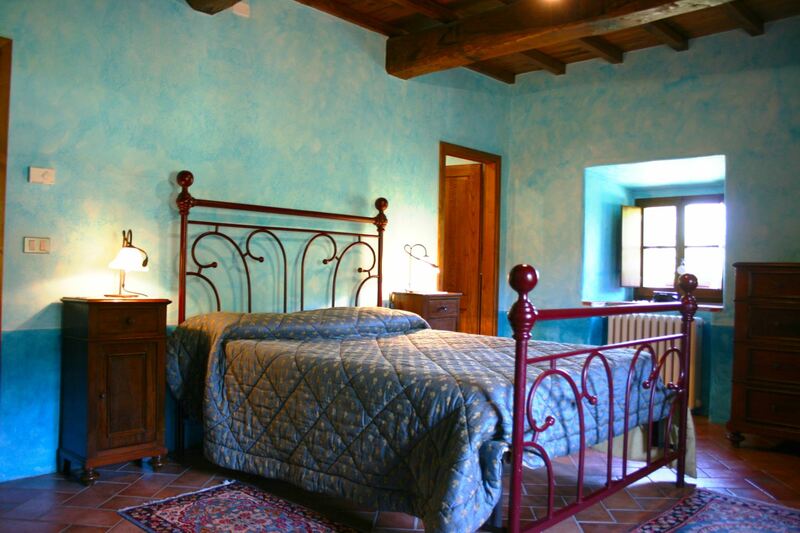 The main house bedrooms are articulated on several levels connected by a typical stone staircase. 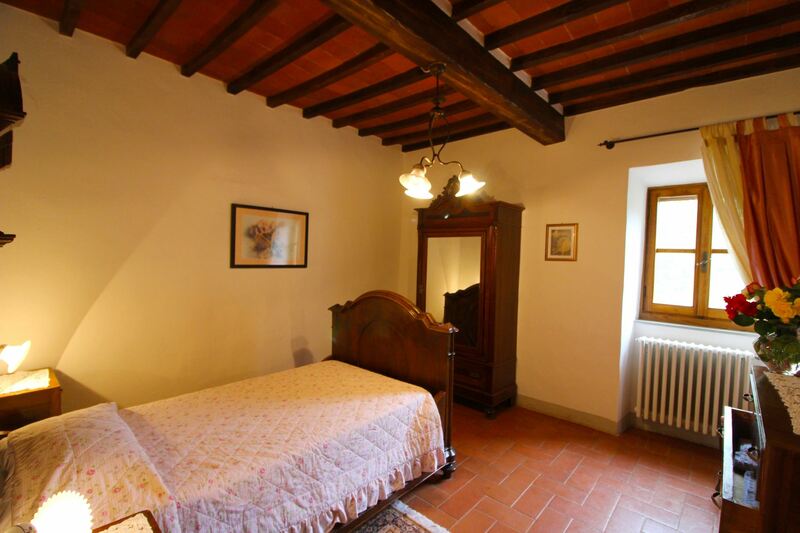 First floor: double bedroom, single bedroom, twin bedroom and two bathrooms with shower. 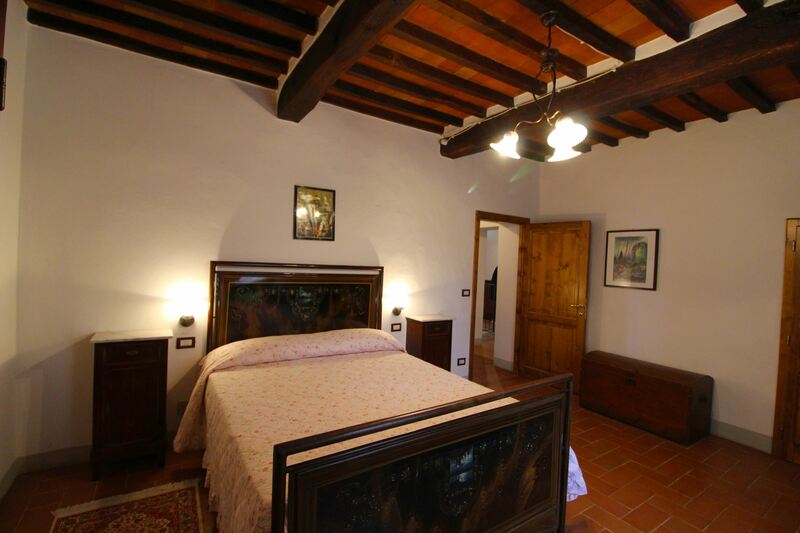 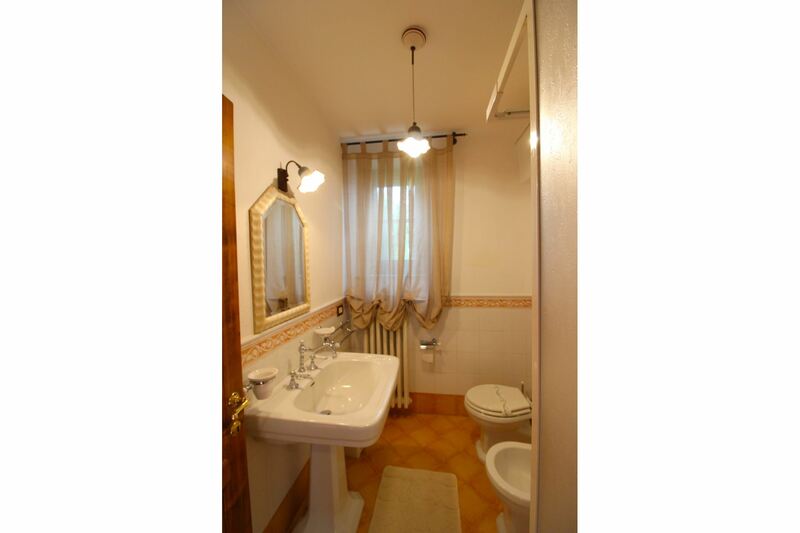 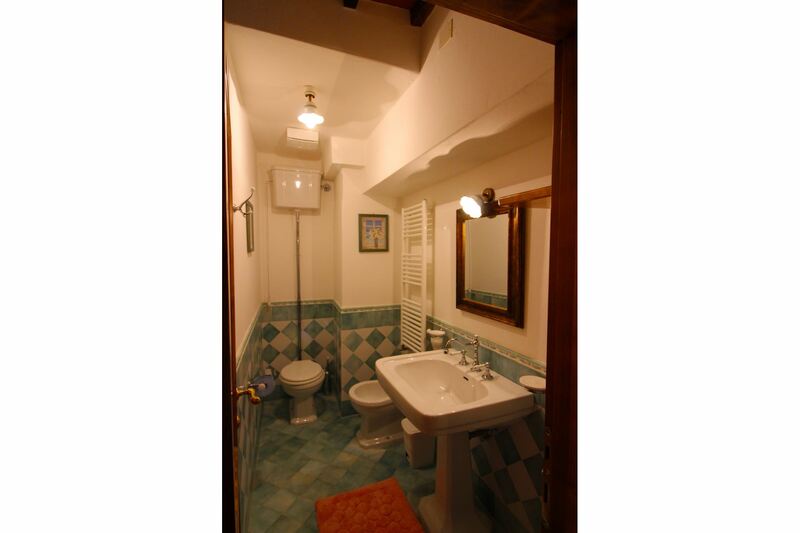 Second floor: double bedroom, two twin bedrooms and two bathrooms with shower. 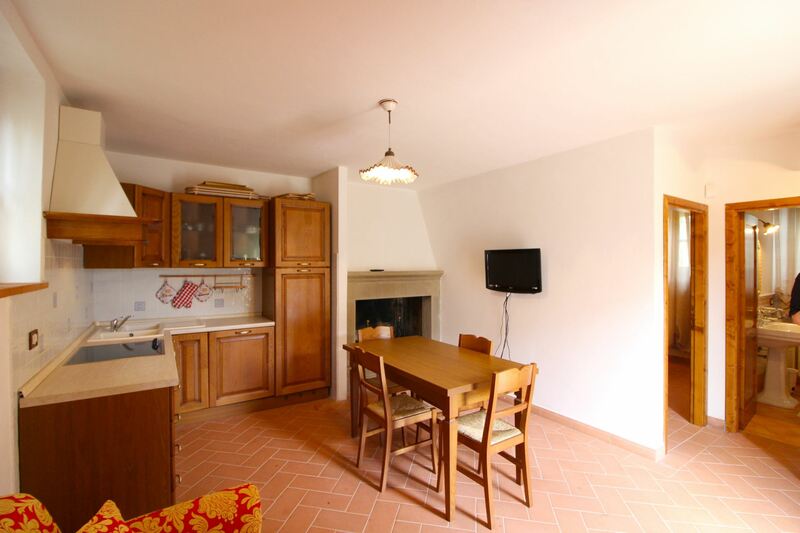 COTTAGE 1: Living-dining room with kitchen corner, sofa and tv, double bedroom and bathroom with shower. 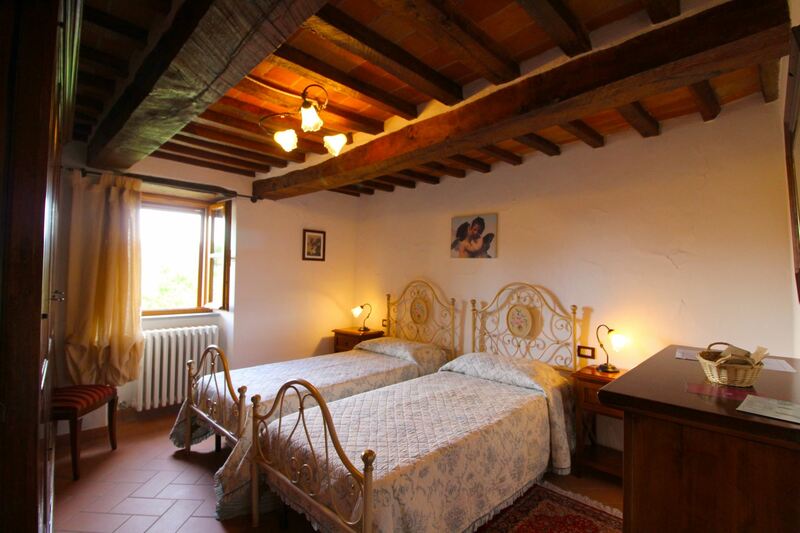 COTTAGE 2: made of two apartments set on two levels. 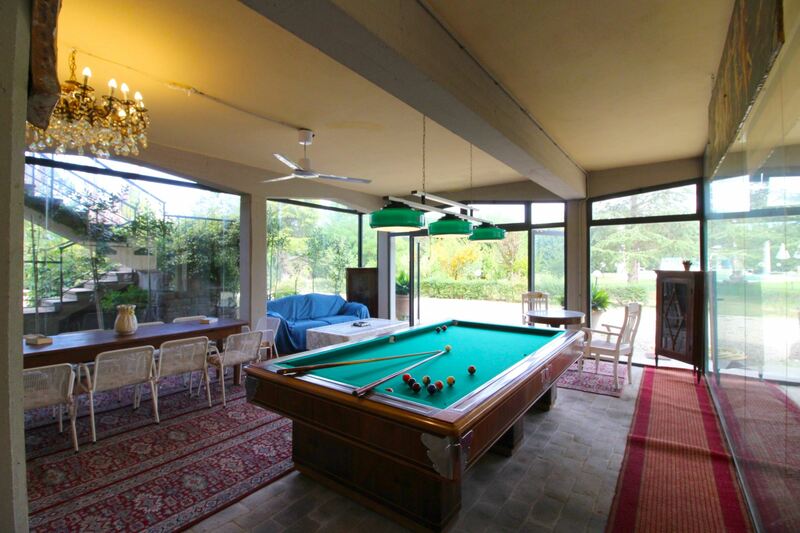 Ground floor: living-dining room with kitchen corner, double sofa bed and tv, double bedroom with private terrace with pool view and bathroom with shower. 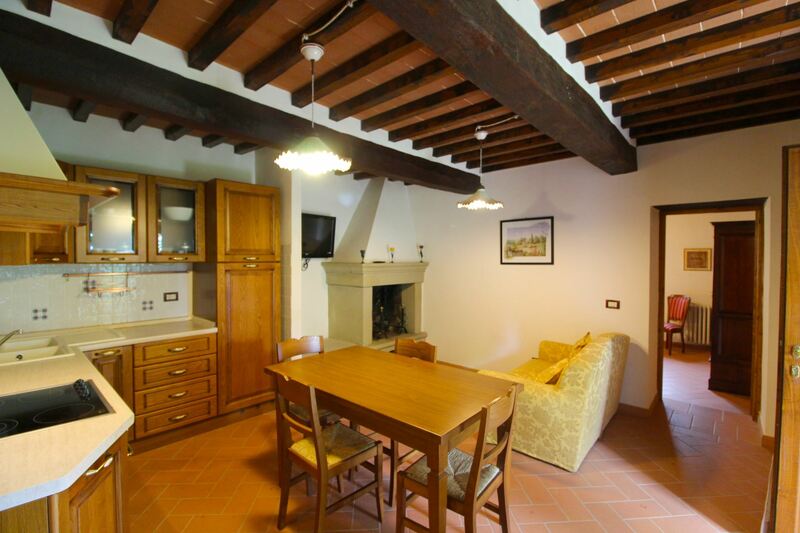 Going down some steps to the lower level of the garden apartment with living-dining room with kitchen corner, sofa and tv, double bedroom and bathroom with shower. 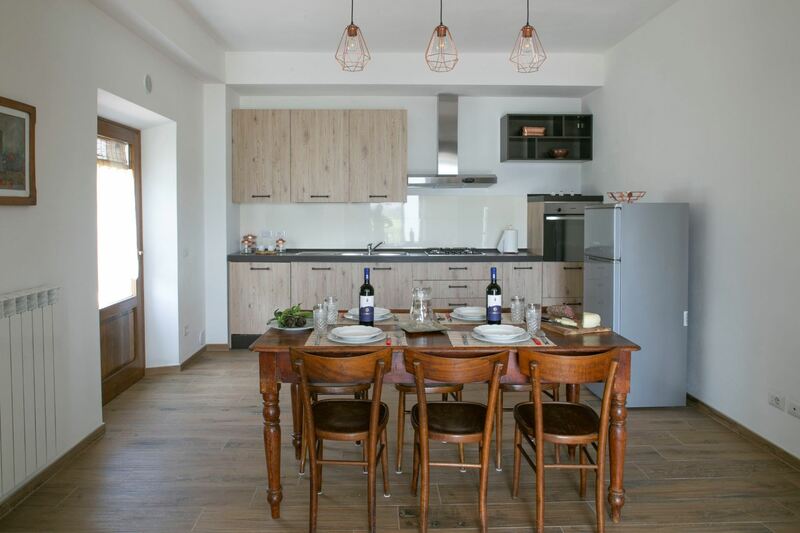 EQUIPMENT: Fridge with freezer compartment (3), dishwasher (3), washing machine, Wi-Fi Internet access, Satellite TV, oven (3), microwave, toaster, filter coffee maker, kettle, mixer, moka coffee maker, fly screens, iron and ironing board, high chair, barbecue, wood burning oven.